With its big, high-resolution display, it’s a shame to just park an iPad when switching to a computer. Instead, Air Display ($10) makes your iPad a second screen for your Mac, extending the desktop. The tool has just been submitted to the App Store and should be released soon; I checked out a beta. You install a utility on the computer and connect with the Air Display System Preference. (It’s Mac-only at launch, but a Windows version is coming.) The iPad then behaves just like an extra screen. You reposition it in the Displays System Preference like a real monitor, in a portrait or landscape view. Although it lags a little when showing video, it refreshes quickly enough for most work. You can even tap on the iPad to click. If you can’t wait for Air Display’s release, you can check out iDisplay ($5) now. But this buggy competitor needs an update to match Air Display’s ease. Air Video can stream 720p video from your PC, and convert transcode video formats in real time. Even if you bought the largest-capacity iPad, if it can’t fit all of your videos, it’s too small. Instead of trying to cram everything into the device, you can stream videos from a local or online PC. The process has one main caveat; if you bought movies or TV shows from the iTunes store, DRM restrictions block those files. (Podcasts and music videos should work.). But you can watch your own videos or DRM-free downloads without taking up iPad storage. Of the many options available, I like Air Video($3) the best. (A free version includes the same functions but limits the number of files you can browse in each folder). Similar to competitors, you run a server utility on your PC or Mac in order to route data to the iPad. In my tests, Air Video played most resolutions smoothly, including 720p video files over an 802.11n Wi-Fi network. That resolution stutters on an 802.11g network, but if you reach a file that’s too big-or just not in an iPad-friendly QuickTime format, including AVI, WMV, ASF, MKV, DIVX, and FLV-you can have the PC remotely convert the clip. Just hit a button from the iPad interface and stream it when ready, or have a speedy PC process it and stream it live. It even supports subtitles and TV output. The iPad can send video to a TV at 1024 by 768 resolution via its $29 Dock Connector to VGA adapter; 576p and 480p with the $49 Apple Component A/V Cable, and 576i or 480i with an Apple Composite Cable (also $49). Apple’s iPad Camera Connection Kit ($29) does so much more than its stated purpose. Instead of just transferring photos and videos from your camera or SD card, the adapter’s USB port attaches a range of devices. Many USB keyboards work. The iPad presents a warning that the device isn’t supported (shown left), but if it doesn’t draw much power, you can ignore the message. Volume and media keys usually work, and you can even use desktop commands such as Command-Z. (Don’t forget that the iPad also officially supports Bluetooth keyboards and Apple’s iPad Keyboard Dock). USB audio devices can work, too–including speakers, headsets, and microphones. If a device draws too much power and balks (as when I connected a Zoom H2 mic and Logitech V20 PC speakers), no problem: just attach the device to a powered USB hub, and connect the hub to the Camera Connection Kit adapter. You can even attach different devices-such as a keyboard and speaker set-at the same time. Apple maintains obsessive control over the iPad, making it less like a computer and more like a media player. But you have an alternative: Jailbreak the iPad, and you can run third-party apps that weren’t approved by Apple. If you’re willing to jailbreak your iPad(which means voiding your iPad warranty and taking full responsibility for anything that may go wrong), then you can also use the Camera Connection Kit to read USB sticks and SD card directories. (Without jailbreaking, you can already import SD-card videos and photos or attach a Compact Flash reader). With a bit more fiddling, you can read files from an external USB hard drive. Those are a lot of unnecessary hoops to jump through for such basic connectivity, but it is at least possible. Again, jailbreaking is best left for the tech-oriented or the adventurous. You would connect the iPad to a computer, run Sprit and then be able to install apps through the Cydia interface. Cydia and iTunes apps coexist, so you can install apps like Backgrounder and Multiflow to enable multitasking (letting you listen to Pandora while working in other iTunes-purchased apps, say). Of course, multitasking is coming officially in OS 4.0. Notes: ProSwitcher (arguably the best jailbreak multitasking app for the iPhone) didn’t appear to be optimized for the iPad (yet) at the time of writing. For jailbreak apps, sticking to those that have been reworked for the iPad will help avoid–though not guarantee against–unnecessary hassle. Other jailbreak apps include iPad-ready versions of Wi-Fi Sync (wireless iTunes syncing), Winterboard (customized themes), and Dashboard (OS X-style widgets). You can also use your iPad with a mouse, run game console emulators and hand controllers, and otherwise do things Apple doesn’t allow. Benefits will grow as the iPad jailbreaking community expands. VNC Viewer can control a remote PC as if you’re sitting in front of it. You just left for the weekend but forgot to copy an important business file (or hilarious LOLcat) to your laptop. Use an iPad to retrieve the content. 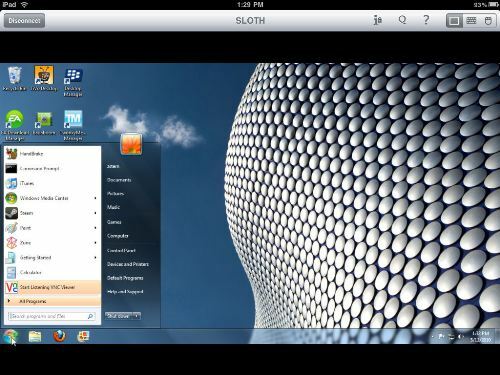 Several remote desktop-style tools present a live view of the distant computer, letting you control the PC as if you were sitting right there. Whether you’re reaching across the Internet, or just into the next room, the process isn’t fast enough to play smooth video. So keep searching for that Hulu fix. But most other applications and slow-moving Flash games -such as Farmville-work if you can handle about 10 to 20 frames per second. Among many choices, I like LogMeIn Ignition($30 if you want to configure as little as possible) and iTeleport ($25), plus VNC Viewer($10) if you want to manually set it up. You’ll first configure the PC with a server utility (or an option built into the OS) first, then you can connect anywhere. All three tools offer similar functionality. You’ll zoom in and out with pinch gesture, and mouse around by touching the iPad. Two-fingered taps activate right-click, and other gestures help with the input. iTeleport includes more keyboard options, such as presets to control media applications, but I thought the implementation got in the way. If you just want to sit back and control a computer hooked up to a TV, Mobile Mouse ($3) can turn your iPad into a wireless keyboard, multitouch mouse trackpad, and media remote. Safari set a great standard for mobile browsing, but many alternatives reveal its missing features. Starting with real tabs, Atomic Web($1) adds many desktop-class benefits. Multitouch swipe gestures even toggle between open sites. But that’s just the beginning. Atomic Web Browser can optionally omit images to save bandwidth, identify itself as various desktop browsers, let you customize the search engine, search for text within a page, modify its buttons, and more. Apple’seBook reader–iBooks–keeps all of your Apple-purchased books together, includes an iPad-specific interface, and interfaces with iTunes. iBooks uses the ePub file format, so while the iPad can read PDFs, you can’t store those files here with the rest of your books. You can, however, convert them to ePub first, and keep everything in one place. To do this, try Calibre— an open source e-book library management application for Windows, Mac OS X and Linux. The software imports a range of formats, including PDF. After installation, click Add books, and select the PDF. Click Convert E-books. In Page Setup, pick iPad as the Output profile. For simple documents, you can even try online conversion through www.epub2go.com. When finished, just drag the ePub files into iTunes, and you’ll sync them the next time you connect the iPad. My results varied depending on the complexity of the PDF. When I tried converting a document with photos and margin sidebars, unrelated sections of text merged. However, the process worked for simpler, text-driven documents. iPad printing might arrive in the future, but you can still print hard copies today. Several apps download network or online files to the iPad and can send them to a printer. Some apps even edit documents first, but many are difficult to use. I had the best luck withPrintCentral, one of many printing tools from the same developer. (The vendor created a chart to explain all the different offerings, but it would have been most helpful to make a single, great app.) You’ll install a print server utility on a Mac or PC, and PrintCentral uses it to reach your local or network printer. PrintCentral’s cluttered interface obscures many settings. But after troubleshooting, it worked. Give it a shot if you have to print today. 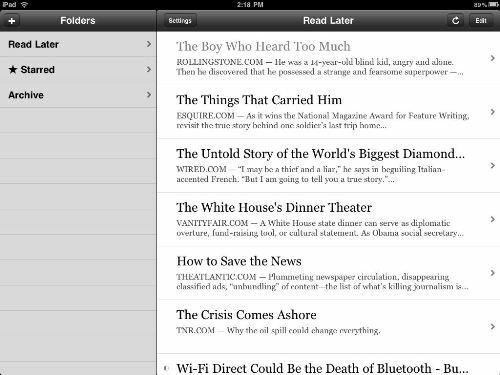 Instapaper Pro manages your online reading list, taking content offline. Whether you have a 3G version or not, your iPad faces certain situations where it can’t be online: planes, train tunnels, and other network-not-found destinations. You can still keep up on all of your favorite Websites with Instapaper Pro($5). This tool manages content you want to read later and caches articles for times that you’re offline.Instead of directly browsing content you want to save, Instapaper interfaces with several PC and iPad apps. Within those tools-Safari, Google Reader, NetNewsWire, Twitterrific, Tweetie, and more-you’ll hit a Read Later button that sends details to Instapaper. Load Instapaper once, when you have a network connection, and it downloads all of those stories. Then, you can dig deep into those articles from any location, with or without a network. Great faders, pots, and buttons make ProRemote stand out. A keyboard-and-mouse combination remains the best way to control a PC, but those days might be numbered. 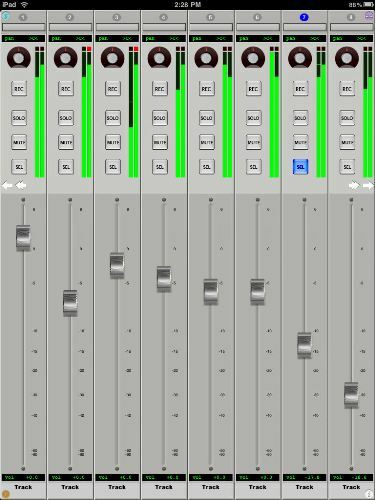 What if you could use the iPad as an interface, changing PowerPoint slides while reading your notes, or even touching faders and dials to interface with pro audio-production tools? You can! I have several favorites among the many different input-device apps. I-Clickr PowerPoint Remote for iPad helps deliver great presentations. TouchOSC($5), DiddyMidiDJ($5), and AC-7 Pro Control Surface ($10) control audio-editing tools. And Folabs makes several high-end virtual controllers, like ProRemote (shown above; $100), that let the iPad control audio production software like ProTools, Apple Logic, and Ableton Live.